Also, buried in this story: "Shin Bet also revealed Monday that it had arrested two Arab Israelis for allegedly planning to carry out shooting attacks at the Temple Mount compound in Jerusalem’s Old City or against Jewish or Christian prayer sites." The Nazareth district court on Monday sentenced a Jewish convert to Islam to 38 months in prison for seeking to join the Islamic State terrorist group in Syria. 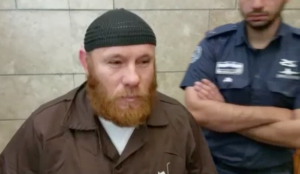 Valentin Mazlevski, 40, a Belarusian immigrant who moved to Israel in 1996, was the first Jewish-born Israeli to be charged for having IS ties, according to the Shin Bet security service. He was arrested in February 2017, a few weeks after a failed attempt to fly to Turkey, from where he allegedly planned to cross into Syria to join IS forces. He acted “out of identification with the organization’s ideology,” in the process “violating the law and endangering the state’s security,” it said. In 2000, while performing compulsory service in the IDF, Mazlevski converted to Islam, after meeting the Arab Israeli Muslim woman who would become his wife and mother of his five children. Mazlevski, who became interested in IS and frequently viewed its online content in recent years, joined the jihadist group’s internet forums, the Shin Bet said. In July 2016, security forces warned him against taking part in IS activities, the sentencing read, but Mazlevski paid no heed and contacted terrorists in bids to join IS fighters in Syria, and later, in Sinai. Shin Bet also revealed Monday that it had arrested two Arab Israelis for allegedly planning to carry out shooting attacks at the Temple Mount compound in Jerusalem’s Old City or against Jewish or Christian prayer sites. The two suspects, who were arrested last month, were also charged with failing to report having knowledge of another group of Arab Israeli men who were also planning to carrying out a shooting attack on the Temple Mount in September, similar to one conducted in July that killed two Israel Police officers….